Tenorshare UltData Review : Why Should You Protect Your iPhone? I haven’t yet lost data on my iphone, none of my team members have lost either. Due to which we never felt need for trying a recovery software. But since I am always playing around with jailbreaking and similar stuff, I felt that my data is somehow at risk. Like every other thing, there are tons of ways you can backup the data of your iPhone. List of options include, iCloud, iTunes and also some other third party softwares. But, there are only a few softwares which are both powerful and genuine and work in efficiently to recover the data of your iPhone. If you look at the most of the options, majority of the softwares are rip offs and cost quite a lot. However, I tried a tons of apps for Iphone data recovery, and finally landed on Tendorshare due to its amazing features and working efficiency. How to Recover Data With Tenorshare? The whole recovering is quite simple and you don’t need to be a nerd or an expert to use the software. This is one of the reasons why I love using this software for this particular purpose. I’ve been using from quite some months on my iPhone 7 ( Review link here ). 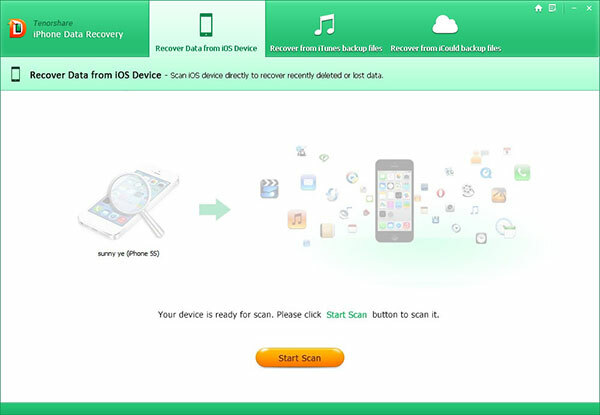 The process to recover iphone photo, or apps, music or any other documents, follow the below steps. 1 . Connect Your iphone with the computer. Make sure the USB connection is good. If your iPhone doesn’t get connected, make sure you have connected USB in the right way. 2 . Open the Tenorshare UltData software from the desktop. It would be available from the desktop if you installed it in the right way. If not available, search for it in applications. 3 . Click on its scan button. The scan would begin and soon results would be displayed. 4 . From the list of the files, choose the files which you need to recover. These can include music files, apps, documents and other files. 5 . Once you select the file, Click on the Recover button.The software allows you to recover different files in various formats, it depends on your selection. And you are done, the process is as simple as that. This is indeed the thing that I love about this software, the developer hasn’t made it complicated so that even simple users can use it. It doesn’t include a learning curve to recover deleted items such as photos. Users just want a solution that just works for them in a simple and fast manner, If this is the fact, the software works pretty good. The software even lets you recover files from a previous iTunes backup ( if you have one with you ). Most of the regular users only need to recover their lost photos or sometimes contacts when we often try to sync with iCloud. Things can surely go wrong if you are trying iCloud for the first time or may be you removed and re-added your icloud accounts. Thanks to this software, it can recover data that dates back to as far as 2011. I believe, that the team Tenorshare UltData has made the software so that the software is easily usable by the normal people too. It is made for users who don’t have so much time to read the manual and make tries several times before figuring out how the stuff actually works. You can do the hit and trial thing because it is about Data recovery and you can’t risk it. The free trial offered by the software would show you all the files that can be recovered, but to recover them, you would need to register. Most of the alternatives which are offered in the lower price tags aren’t as much effective as this one if compared thoroughly. Also, the support offered by the company is quite friendly and thereby worth the money. This means that if you are buying their software, you’d also have access to a quite friendly and intelligent support team. If you can’t afford to lose your data and want it back at any cost, this software is certainly the answer. Message: I hope that you have enjoyed 'Tenorshare UltData Review : Why Should You Protect Your iPhone?' article on Tips2secure. However, if you want me to deliver more items, then please share my post. You can use Social Sharing Widget provided at the end of every post. After all, Sharing is Caring!